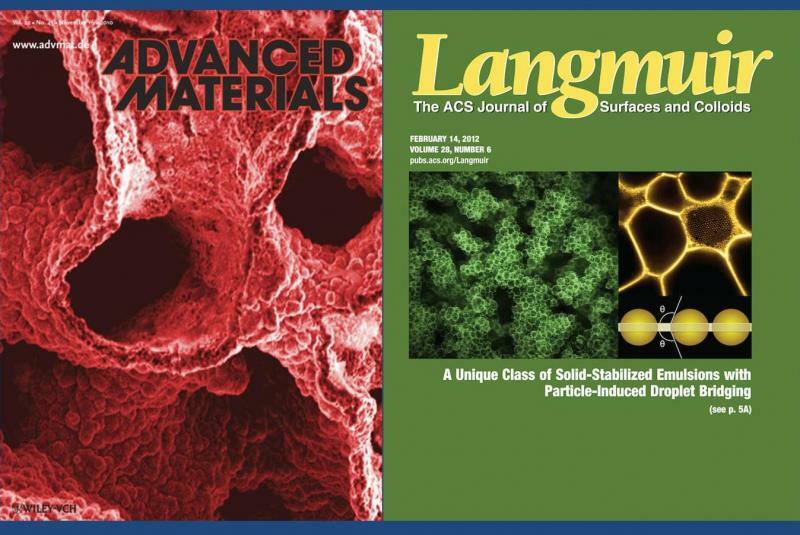 Assistant Professor Ali Mohraz, Ph.D., Department of Chemical Engineering and Materials Science, has had his research on interfacial colloid assembly featured as cover articles in the journals Advanced Materials and Langmuir. Particle self-assembly at liquid interfaces is a complex phenomenon involving elements of interfacial phenomena, suspension mechanics and thermodynamics. A better understanding of the interplay between these various elements can pave the way for new applications of these multi-phase systems in diverse technologies including drug delivery, personal care, oil industries and food products. Mohraz’s team exploits colloidal self-assembly at liquid interfaces to create multi-phase materials and composites with unique microstructure and electrochemical/mechanical properties that can be exploited for their use in fuel cells, batteries, tissue engineering scaffolds and oil recovery systems. In the Advanced Materials article entitled “Bicontinuous Macroporous Materials from Bijel Templates,” colloidal jamming at the interface of liquids undergoing spinodal decomposition is exploited by Mohraz and his team to create composite materials with bicontinuous morphology that can be finely tuned at the micrometer scale. In the Langmuir article entitled “Characteristics of Pickering Emulsion Gels Formed by Droplet Bridging,” Mohraz’s team utilizes particle bridging across liquid-liquid interfaces to develop a novel class of multi-phase mixtures with gel-like rheology that is solely governed by the solids loading. Mohraz received a B.S. degree in chemical engineering from Azad University in 1996, a M.S. degree in chemical engineering from the City University of New York in 1999, and a Ph.D. degree in chemical engineering from the University of Michigan in 2004. He then completed a postdoctoral fellowship at the Frederick Seitz Materials Research Laboratory, University of Illinois at Urbana-Champaign. Mohraz was awarded a Faculty Early Career Development (CAREER) Award from the National Science Foundation in 2009.